I have dusted off the Ultimate3 QRSS beacon kit that I built earlier in the year while a foundation licensee. Having progressed to a intermediate licence I can now operate something I’ve constructed. Until now it has been attached it to a dummy load with the FUNCube Dongle Pro+ SDR in close proximity as a receiver for experimental purposes. One unresolved issue was it being consistently off frequency. The DDS modules used are prone to temperature fluctuations and component variances so the Ultimate 3 has the option of using a GPS module to provide both an accurate time source and an accurate 1PPS input which can be used to self calibrate. Except in my case it had proved to be unreliable. I am using one of the inexpensive GY-GPS6MV2 modules containing the U-Blox chipset I posted about previously with the additional tap off to provide the 1PPS TTL signal. Initially the GPS module was connected in close proximity to the Ultimate3 but struggled to maintain lock probably due to interference from the DDS module. Even when lock was achieved the calibration never seemed to work. I posted a question on the yahoo support group and from the answers I verified the calibration setting were correct so the only likely culprit was the quality of the 1PPS signal. The serial NMEA sentences and the 1PPS signal from the GPS are likely to be required in other planned projects, such as an ‘shack clock’ and a GPS disciplined frequency standard. So I decided to put the GPS module into a waterproof housing that can fitted on the shack roof in clear view of the sky and away from any potential interference. A multi-cored cable supplies power and the TTL RX/1PPS signals being fed back to the bench. Sourcing an inexpensive weatherproof enclosure (£2) and waterproof cable gland were straightforward enough. I mounted the GPS module on a piece of strip board and replaced the on board LED with one mounted in the enclosure so I easily determine if the GPS had achieved lock, since it only flashes when it has. The LED is sealed with epoxy resin. It should be noted that the outputs of the U-BLOX chip are only rated at 10mA so bear it mind when selecting an LED and calculating the current limiting resistor. The connecting cable is some surplus unscreened alarm cable fitted with a couple of ferrite clamps. The GPS now has no trouble achieving lock and quickly sets the Ultimate3 clock. Researching the 1PPS problem I hadn’t come up with anything definite, as the signal looked okay on the oscilloscope. But I decided to fit a 10K resistor pull up resistor between the 1PPS output and the 3.3V supply on the GPS module. If this actually made the difference I have no idea but the Ulimate3 now successfully calibrates the DDS using the GPS. At the moment I have configured the beacon to run WSPR and I have been spotted by other operators. Initially I wasn’t getting much RF out of the device and it turned out to be a combination of poor connection caused by me not removing the enamel properly on a toroid winding and an iffy antenna connector. Both have been corrected and now get a measurable deflection on the SWR/Power meter. With the additional of a second power amplifier FET it is around 200-250mW. I purchased the Ultimate3 with a low pass filter for the 40M band and while I have had some European spots the results have been a little disappointing. 40M has turned out to be almost unusable at my QTH due to QRN/M so not sure if that is having an effect, also the antenna I have isn’t naturally resonant on 40M so is going through a tuner which will certainly be introducing some losses, without the tuner the FETs get very warm! With this in mind I have purchased some additional LPFs for the 30M and 20M bands and the LPF relay switching board for the Ultimate 3 so can try/run multiple bands. Several of the Arduino projects I have been experimenting with have used a GPS module to provide accurate time and/or location information and in the case of the QRSS/WSRP QRP beacon a highly accurate GPS derived 1 second pulse is used for frequency calibration. A number of people have enquired about the GPS module I am using. Therefore when I was sourcing a GPS I had search specifically for a inexpensive device using a U-BLOX. 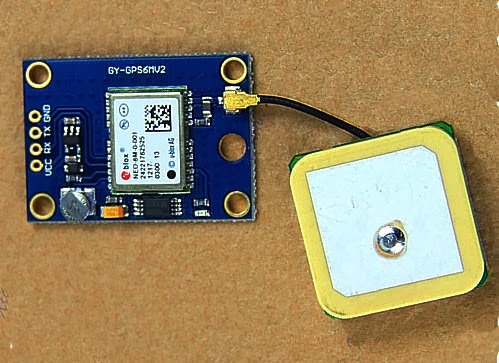 I soon found something called a GY-GPS6MV2, it appears to be a generic design and is readily available on eBay from suppliers in China, Hong Kong and Singapore and can be purchased at the moment for around than £10 (approx $15) including postage! It is also available from domestic suppliers but often at a much more inflated price, but you don’t have to wait several weeks for them to be delivered. There are many other GPS modules available but this module seems to be one of the cheapest available. it is often listed as a NEO6MV2 GPS Module Aircraft Flight Controller. The module consists of a small PCB 25mm x 35 mm size with a separate ceramic antenna connected by a small lead which is 25mm x 25mm in size. The Antenna is quite heavy and isn’t suited to Pico HAB payloads but for other uses is more than satisfactory. The board has four connectors VCC, GND, TX (Transmit) and RX (Receive) and can be powered by the 5V supply on Arduino boards since it has a small regulator to provide the 3.3V needed. In most projects all that is required is data out of the GPS. 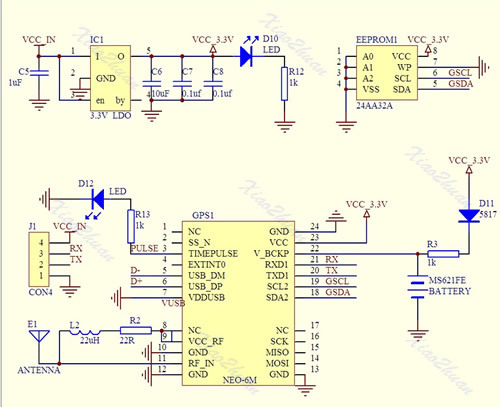 The GPS TX (data out) being connected directly to the microcontrollers RX (data in) The (0V and 3.3V) level shift of the signal is compatible with the TTL input of the microcontroller. The GPS by default will start up and output standard NMEA sentences at 9600 Baud, until GPS position lock is achieved the NMEA sentences won’t have a long/lat location. The module also has an LED which will start flashing once a lock is achieved. 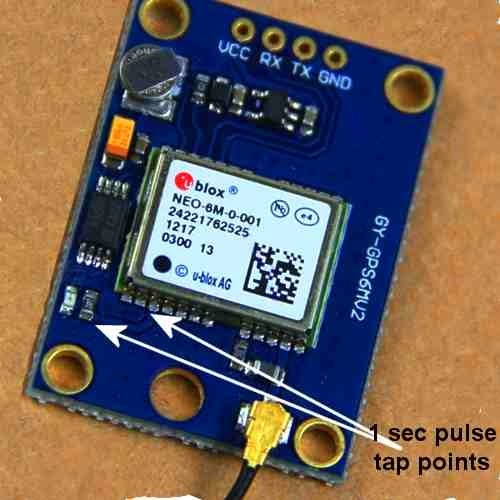 There is no direct connection for the highly accurate 1PPS (pulse per second) signal that can be used for frequency calibration, but the flashing LED is driven by pin 3 of the GPS module which is the 1PPS (pulse per second) signal required. The 1PSS signal, like the TX is either 0V and 3.3V, in order to use it a small lead will need to be soldered onto the board, either directly onto Pin3 of the GPS chip, or alternatively on to the small current limiting resistor used by the LED, as indicated below.